Brandon Youth Club is hosting a Local dog walk on Saturday 7th April 2018 between 11.00am and 1.30p.m.to raise money for the Dogs Trust. Please see link below for more information. Little Treasures Autism Group (LTAG) was founded in 2016. It is a support group for children who either have an ASD diagnosis or are currently undergoing assessment and their families. They run several Stay & Play sessions and Parent Support Groups in various locations in County Durham. All ages are welcome, including siblings, dad’s, grandparents and carers. LTAG have recently secured a new venue for a new group for children aged 9-16 years old. This will be held at at The Hut in Ushaw Moor. The first session takes place at 6:00-8:00pm on Thursday, 15th February 2018 and will continue on the 3rd Thursday of each month. Children of all areas are welcome to attend the group. The cost per session is £2. The local community came together for the Christmas tree lights switch on event in Ushaw Moor on Friday 1st December 2017. Choirs from Silver Trees and St.Joseph’s Primary schools sang carols while Fr.David Coxon performed the switch on. The Baptist Church kindly provided hot drinks during the event. If you would like to have a chat with friends or learn a new skill New Brandon WI meets on the 2nd Tuesday of the month in St.Andrew’s Church, Brandon. The next meeting will be held on Tuesday 13th February 2018 at 7.00p.m. The topic for the evening will be ‘ Andrew’s Journey’, the story of learning to live with a rare disease. Brandon Community Hall will be hosting a Reg Vardy Brass Band Concert on Saturday 23rd September 2017 at 7.30p.m. Tickets are £5 each and can be obtained by calling 07751 630886. A new Memory café will be held in The Orchards, Brandon the last Thursday of every month starting on Thursday 31st August from 2.00 – 3.30pm in the communal lounge. If you or anyone you know is suffering with Dementia or Alzheimer’s the cafe will provide a warm welcome to you. County Durham’s best kept parks and green spaces are up for a national award. Keep Britain Tidy is asking people across the country to choose their Park of the Year and six County Durham sites are in the running. Blackhill and Consett Park; Annfield Plain Park; Chester-le-Street Riverside Park; Hardwick Park, Sedgefield; Wharton Park, Durham; and Bishop Auckland Town Recreation Ground are all eligible for the People’s Choice Award as they hold Green Flag Status. The Green Flag Award recognises excellence and good practice in the management and development of parks and open spaces in England and Wales. 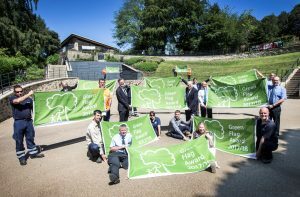 Durham County Council, which oversees the county’s six Green Flag parks, is calling on members of the public to take part in the vote and secure the People’s Choice Award for the county. Cllr Brian Stephens, Durham County Council’s Cabinet member for neighbourhoods and local partnerships, said: “We are very proud of our parks and green spaces here in County Durham. People can cast their vote online by visiting www.greenflagaward.org, clicking on County Durham on the interactive map and selecting their favourite park from the list. Voting closes on Saturday, 30 September and the UK’s 10 most popular parks and green spaces will be announced in October. For more information about Green Flags in County Durham, visit www.durham.gov.uk/greenflags. Pictured above is Council leader Cllr Simon Henig and Cabinet member for neighbourhoods and local partnerships Cllr Brian Stephens with Durham County Council staff at Wharton Park. 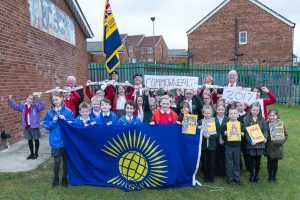 Parish Councillors, local schoolchildren, clergy and members of the community gathered together on Monday 13th March 2017 at Carrside Youth & Community Project to celebrate Commonwealth Day. The Chairman of the Parish Council officiated at the event which included children from Our Lady Queen of Martyrs RC Primary, Esh Winning, Browney Academy, Silver Trees Primary and St. Joseph’s RC Primary in Ushaw Moor and Brandon Primary. The Chairman opened the event by welcoming everyone present and then read out a message from the Secretary-General of the Commonwealth Nations. The commonwealth affirmation was read by Poppy Jackson, from Our Lady Queen of Martyrs school and the children from Brandon Primary read out short pieces about the 12 principles of peace-making and displayed bunting made up of the 53 Commonwealth flags. Refreshments were provided by Carrside Youth Club following the ceremony. The Christmas tree lights switch on event in Ushaw Moor will take place on Friday 1st December 2017 at 3.30p.m at the centre of the village. Choirs from Silver Trees and St.Joseph’s Primary schools and Deerness Community Business College will sing carols while Fr.David Coxon will perform the switch on. The Baptist Church will be providing hot drinks during the event. Everyone is welcome to come along to this festive community event. 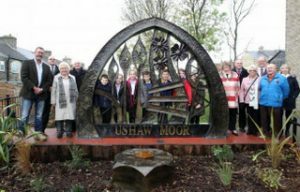 The Chairman of the Parish Council performed the official opening of the new sculpture at Whitehouse Lane on Monday 14th November at 11.00am. Local school children, community group representatives, unitary and parish councillors were among those attending. The project has finally com e to fruition thanks to funding from the Local Members AAP budgets, the Parish Council and S106 monies from local developments at Cockhouse Lane and Whitehouse Lane. Local school children who were involved in the design process with Sculptor, Graeme Hopper earlier this year really loved the sculpture and were proud that they had had some input into the design. One young girl described the sculpture as ‘magnificent and enchanting’, which really struck a chord with those present. The Sculpture depicts the mining history of the area and the inclusion of poppies commemorates the centenary of the First World War and conflicts since. There is also a permanent fixing for an annual Christmas Tree so the local community can come together to celebrate the festive season.